Boycott Ice Cream Chain "Sweet Jesus" for "Pimping out Pints" of "Sweet Baby Jesus"- Blasphemy! Boycott Ice Cream Chain “Sweet Jesus” for “Pimping out Pints” of “Sweet Baby Jesus”- Blasphemy! A boycott of a blasphemous ice cream chain that has branded the name of Jesus, taking the Lords name in vain is being signed by Christians far and wide. The ice cream shop “Sweet Jesus” claims to be “pimping out pints” of “Sweet Baby Jesus” ice cream for their customers consumption, served up in cups stamped with the anti-christ upside down cross. Well, that statement may not be true for much longer as multiple petitions are making the rounds on social media explaining the blasphemy present not only in the name of the company, but also in the imagery used in their ads. CitizenGo has over 10,000 signatures of people readily rejecting this blasphemy. Life Site has a petition with over 2,000 signatures at the time of this post, and Change.org is the petition that started it all with 500 signatures so far. The Sweet Jesus chain now has 19 locations in Canada, and one at the Baltimore-Washington International Airport. 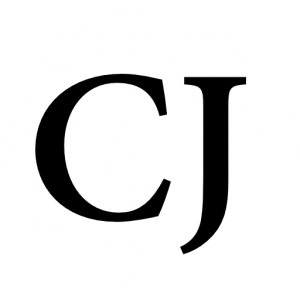 It has plans to open in other U.S. locations, such as Mall of America. The symbolism present in everything from the menu to their promotions intends to undermine the Christian faith and mock Jesus Christ, as shown below. 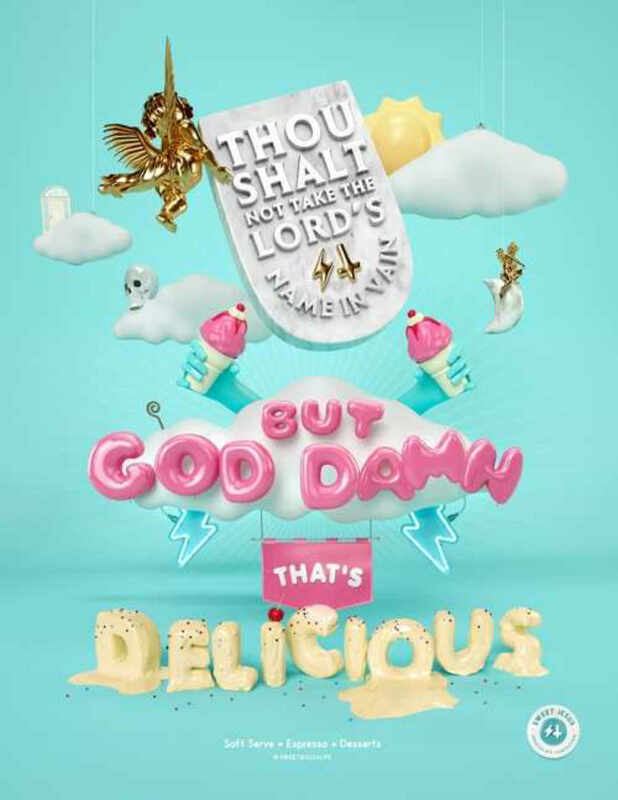 In a promotion, a golden cherub flies while lifting and upturned stone with the commandment, “Thou shalt not take the Lord’s name in vain.” Underneath the commandment is a rain cloud with lightning bolts labeled, “But God d****” and underneath the cloud, “that’s delicious.” Notice that the companies logo in the bottom right corner is a circle with the satanic cross and a lightning bolt inside. In celebration of Easter, the company posted an inappropriate ad of a over-done child dressed in her Sunday best and bunny ears. She wears a cross but has red smeared around her mouth from the “Sweet Jesus” ice cream she’s eating. The next ad features a boy dressed in a sailors outfit, smoking a pipe, covered in tattoos, and wearing a cross. With a monkey on his shoulder, he sips tea from a cup labeled, “Sweet Jesus.” The companies logo is dispersed in the letters of the name of the ice cream shop, showing just how anti-Christ they would like the world to be. 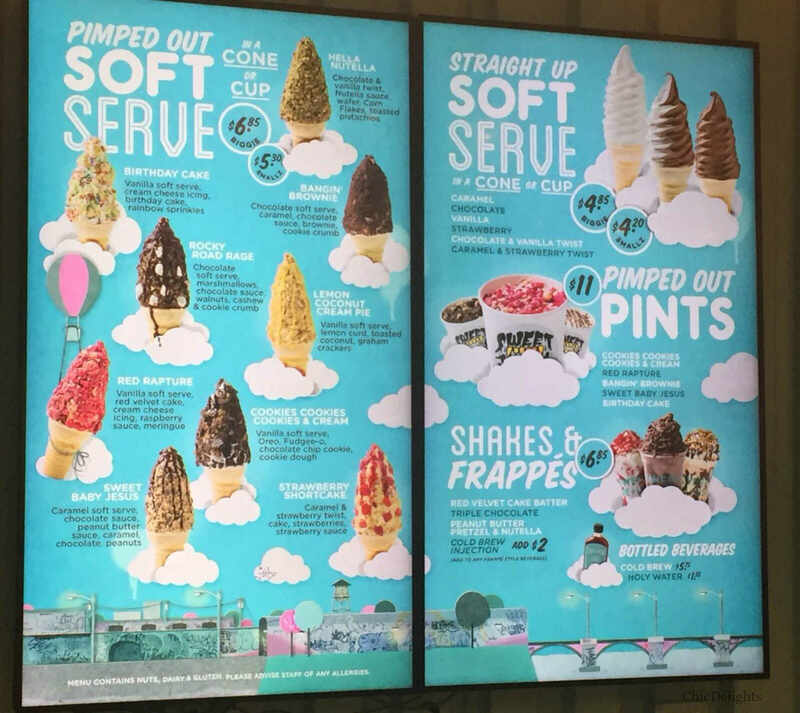 Below is an image of their menu listing a couple of their flavors, “Sweet Baby Jesus” and “Red Rapture.” The company even sells “holy water.” Another ad shows a Nativity Scene, but instead of Baby Jesus, there’s an ice-cream cone. If you have a minute, please be sure to visit the sites above to sign your signature in support of the removal of this blatant blasphemy.